One of my good friends has a low maintenance approach when it comes to beauty but her one indulgence? A weekly pampering session and soak in the bath, every Sunday night. I always try to remember this when choosing a gift for her. 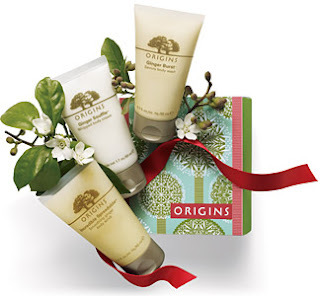 Proving that bathing needn't be boring, today I've rounded up 3 Christmas Gift Sets for those bathing beauties. Origins' Ginger range is wonderfully warming and perfect for this time of year, so what better gift than Go Ginger Gift Set, £20. Containing miniature versions of Ginger Souffle Whipped Body Cream, Ginger Burst Savoury Body Wash and Incredible Spreadable Ginger Body Smoother, the products would be a fantastic treat to come home to after a brisk winter's walk. Check out my review of the fabulous Incredible Spreadable Ginger Body Smoother, included within the set, by clicking here. Lush are arguably the High Street kings of bathtime and their Christmas pre-wrapped gifts offer the ideal, ready-made present for time pressured shoppers. Their Mr Frosty knot wrap is almost too cute to use but is worth opening as it contains a Golden Wonder Bath Bomb, So White Bath Bomb and their infamous Lil Lush Pud Bath Bomb. 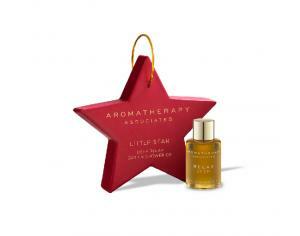 Regular readers will know that I'm a big fan of Aromatherapy Associates' Bath & Shower Oils. Frankly, I think the world would be a nicer place if everyone used these (ok, I realise they are somewhat pricey). Their Little Star Gift is an adorable way to introduce someone to the brand this Christmas and is priced at a wallet friendly £10. What's more, once you know that they like Aromatherapy Associates (which they will), you'll have gifts wrapped up for years to come as they discover the extensive product range.